Do you watch YouTube videos? I’m sure you do! I have been a YouTube addict for years, mainly feeding my addiction with beauty vloggers (I swatted up on how to do my own Wedding make-up by watching You Tube) and occasionally ASMR (if you haven’t heard about ASMR, don’t judge too quickly…it is so relaxing!! 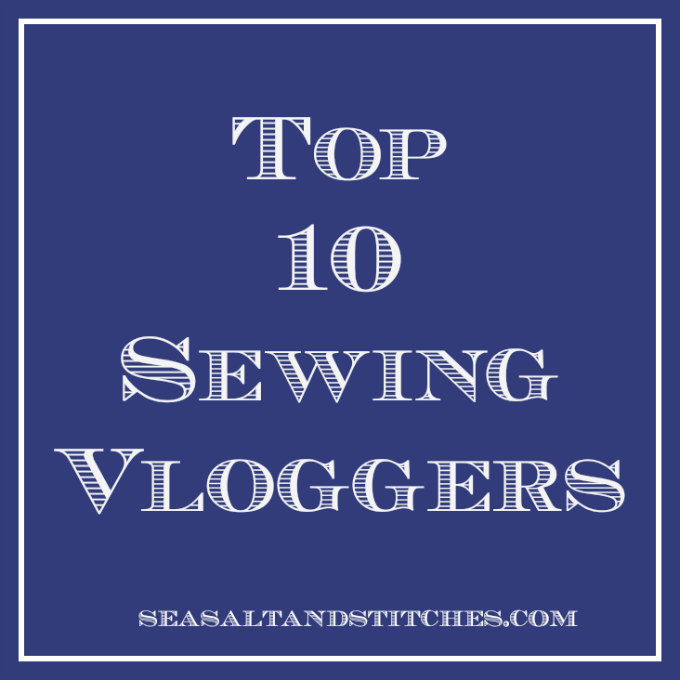 ), but recently I have been binging on all the amazing sewing vloggers that have emerged. In the past, the sewing videos on YouTube were all mainly informative tutorials, often a bit too amateurish for my enjoyment (sorry, but just being honest). However, over the past year I have seen a new style of sewing videos emerge – the sewing vlogger. These lovely ladies basically just sit and chat about their sewing plans, their sewing makes and just general sewing chat…which is wonderful to watch! Lisa Comfort may be the Queen of sewing vloggers, and no doubt the inspiration for many of the following channels. She has been uploading wonderful sewing vlogs every friday for years and I look forward to them every week! Jen shares her lovely makes and sewing plans in a very matter-of-fact way, perhaps due to her scientific background, and I am always inspired by seeing what she has made and what her future sewing plans are. The always happy and super sweet Rosa has been sewing for a long time, and has a plethora of beautiful makes which she has shared with us on her channel. An American sewing vlog, this channel is brought to you by two lovely ladies, Abbey and Lindsay. Its great to get an American perspective on all things sewing related and they always have lovely things to share. The very bubbly Gabby is definitely taking the sewing vlog world by storm, even though she only started vlogging about 5 months ago! Her videos are always great to watch and she makes lovely things so I’m not in the least bit surprised. Jess vlogs over in Australia and uploads a video every Sunday. Again, it’s lovely to see what the sewing scene is like in another part of the world and her videos are great. We head over to Wales now, and the lovely Leigh. Although her channel might be called The Clueless Seamstress, I really don’t think she lives up to that name because she has made so many wonderful things, including trousers, and they are not easy!! Hollie is another vlogging newbie, only starting about a month ago, but she already has over 7 vlogs up on her channel and has even come up with a fantastic Seamstress Tag, which has been great fun to watch! Keep up the great work Hollie! Sian has killer sewing skills, and a killer body (ever so slightly jealous of that tiny waist!!). She makes the most gorgeous fit and flare dresses out of beautiful fabric, you definitely have to check them out if you haven’t yet! Connected with The Fold Line online sewing community, Kate and Rachel bring us very informative vlogs about the latest sewing pattern releases, behind the scenes at sewing meet-ups as well as sewing book reviews. These are by no means the only sewing vloggers out there, merely the main ones I watch. Please do let me know if you watch any other vlogs that you would recommend, I would love to know of more! Eep…it’s me!! Certainly a little bit nervous about putting myself out there…I hope you guys enjoyed my first vlog and are able to leave me a little comment or ‘thumbs up’ over on YouTube. I have lots of plans for future vlogs so I do hope I am able to make them!